The 21st Century Urban Disaster: How Do We Respond? The 2011 earthquake and subsequent tsunami that struck Japan one year ago was the most expensive natural disaster in world history, totaling nearly $235 billion in recovery costs. It also signified a growing trend that is putting urban residents -- primarily in low- and middle-income countries -- most at risk for similar future disasters, and highlights the increasingly complex nature of humanitarian responses to urban disasters. Recently, Courtney Brown, CHF's Director of Humanitarian Assistance, released an issue brief detailing the challenges of the 21st century disaster. 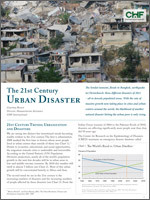 Brown argues that two distinct but intertwined trends are becoming readily evident in the 21st century: the world's growing population is concentrating in urban centers; at the same time, the number of reported natural disasters is increasing. These two trends mean that the numbers of people affected by those disasters is also increasing. The intersection of these two trends will shape the face of disaster response in the 21st century: humanitarian responses will increasingly be mounted in complex urban environments, more frequently than in rural environments, which dominated disaster response in the 20th century. What are some of the key differences between rural and urban disasters? Rural residents in low-income countries are most often farmers who make their own food and sell what surplus they have to their neighbors. Very few people in urban environments grow their own food. They are reliant on a complex of markets and distribution chains. Likewise, rural livelihoods are based around the household farm. But in cities livelihoods are commerce-based and inter-related. We have to focus on supporting markets, not bypassing them, and supporting these urban livelihoods. This means that in responding to disasters, the unit of intervention cannot be at a household level -- it has to be at the neighborhood level. CHF recently piloted a project to work on this level in Port au Prince, Haiti. 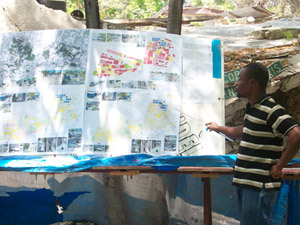 Our initial focus in disaster response in Haiti was on rubble removal and shelter construction. As we implemented these programs, we began to imagine a more integrated approach where the holistic needs of a neighborhood would be met and where long term reconstruction goals could be implemented at an early stage of disaster recovery. Funded by USAID's Office of Foreign Disaster Assistance, Katye (Haitian Creole for "Neighborhood") is a project currently being implemented in the Ravine Pintade neighborhood of Port-au-Prince, one of the areas most badly affected by the 2010 earthquake. Two-thirds of the nearly 1,000 families living in the area were left homeless by the disaster. CHF has worked with the local community to map the neighborhood, redesign housing, street layouts and drainage to house people effectively and to minimize harm from future disasters, as well as to allow access to the neighborhood for industry and services. We have also worked, for example, to create a rental market and document land tenure. You can read more about this case study in the issue paper. We view this program as part of an ongoing evolution in disaster response; CHF, governments, other NGOs and donors can learn from it, build on it, and together improve the world's response to the impending urban disasters we will unfortunately see in the 21st century. The 20th century image of relief agencies driving trucks through dusty landscapes and throwing branded sacks of food and water to starving families will gradually fade from our television screens and disappear from our newspapers. In the urban disaster, food and water will come from proximate, less affected markets, as the urban economy shifts and adjusts to the shock of the disaster and vendors find new suppliers. The agro-pastoralist with his starving livestock will be seen less frequently; the impacted citizen may be a plumber, a taxi driver or a day-laborer. And flooded rivers will not destroy just farmland; we will see images of drowned slums and residents paddling boats between roofs and floating cars. Regrettably, disasters are inevitable. But with continued investment in disaster risk reduction activities, municipal governments can mitigate the impact of those disasters when they do occur. Where families and neighborhoods are affected, the humanitarian community, in close cooperation with host governments, is adapting to the new world around us to mount aid programs that are designed around the unique complexities of the urban environment.